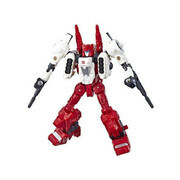 Hasbro UK Transformers Update - Due to the drip feed style of deliveries we now currently have Transformers Siege Wave 2 Prowl in stock, Ironhide and Sixgun processing and Bumblebee Movie Voyager Optimus Prime due next Monday due to a Hasbro system error! We know many of you guys who pre-ordered have bundles waiting for everything to be in stock and its as frustrating for you as it is for us. Our admin has been working overtime to get through sporadic invoicing and cancellations but there is some light at the end of the tunnel with the remaining items due in towards the end of April. We always like to keep customers in the know and going forward we will now be using Hasbro UK as little as possible, maybe in the future when they have things settled we may try again but for the time being things are almost unworkable from a pre-sale point of view and ultimately it is you the customer that ends up unhappy which is unacceptable. We want you to be happy so will be working our socks off to bring back our old service levels and product offerings, prices may be slightly higher but the stock will be guaranteed and available on time with minimal disruption.